A member of the China Musician Association, China Nationalities Orchestra Society, and China National Wind Instrument Society. 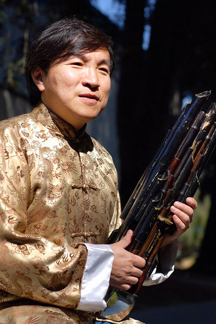 Mr. Guo studied the sheng, guan, suona from the famous wind instrument maker and performer WU Zhongfu in his childhood. He attended Beijing Youth Palace Chinese Orchestra and performed solos. In the end of 1977, Guo joined China National Chinese Orchestra. Since then, he recorded many pieces of music for broadcasting stations, recording companies, movies and TV shows. Along with the Orchestra, he visited France, German, Australia, Denmark, and the US, including over hundred solo performances. As a member of Asian Orchestra whose musicians were from China, Japan, and Korea, he performed in many cities in these three countries. In 2000, he was invited as a guest musician to perform in Singapore Chinese Orchestra for three months. He served as a deputy supervisor in the Orchestra 1992-1996. During that period. Guo was a conductor in training Beijing Demao Middle School and Huayuancun Middle School. The latter won second place in a Beijing middle school Chinese orchestra competition.